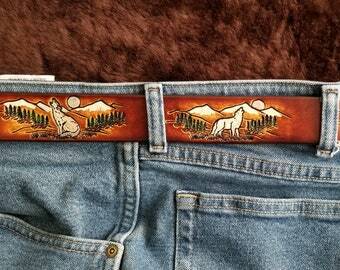 Grizzly Bear with tracks, Leather Western Belt, Russet Brown Color With Background and scalloped border, Hand Made, FREE Name or State name. After almost 6yrs the wallet you crafted for my husband still looks beautiful. Thank you for a perfect long-lasting product. 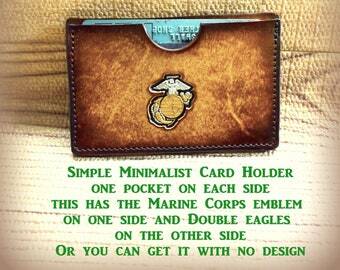 With many wallets and credit card cases to compliment it. Leather Goods the way you've always wanted them but didn't know where to get them! Wallets, Card Holders, Belts, Dog, and Cat collars and much more. Many of our smaller items like key Fobs, Card Cases make wonderful Groomsmen and Bridesmaids gifts, contact us for quantity discounts. 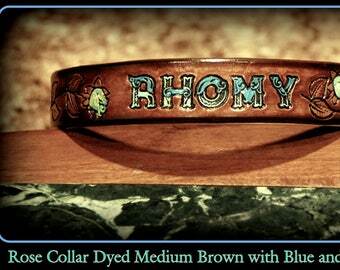 Made from REAL LEATHER.....You simply can't get a better product than we hand produce, in Portland, Oregon. Hand Chosen leather is one reason we can say that our Belts and Wallets typically last 10 to 15 years. 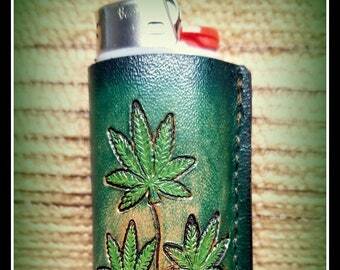 Every item is painstakingly stamped and dyed by hand. Unisex Leather handmade bracelet cuff, Lone Wolf, 1.5 inches wide, initials can be added on either side of wolf, sizes to up to 11"
Animals, Eagle, Bear, Deer, Elk, Wolf, Leather Western Belt, Russet Brown With Background and border, Hand Made, FREE Name or State name. 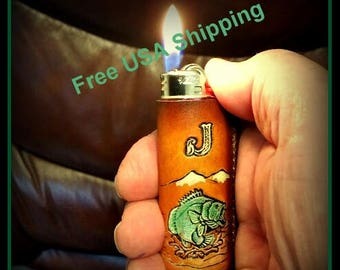 Dinosaurs, Children's Personalized Leather name Belt, Infant to Size 12, under 30 bucks, , painted, what child doesn't like Dinosaurs? Personalized Children's Leather Motorcycle Belt, from Infant to Size 12, Handmade, with Motocross bikes, hand painted, for little rider....? 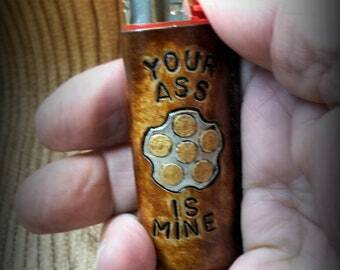 Very nice handmade item and shipped quickly. The item is perfect! So glad i ordered it! This is a very well made product. Boyfriend loved this and is using it daily for carrying his business cards. Shipping was very quick; thank you! 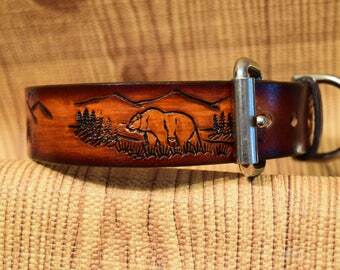 Real leather bracelet cuffs...Lone Wolf design. ..
1.5 inches wide your choice $22 with the unpainted wolf and background or $27 for the full blown paint job. 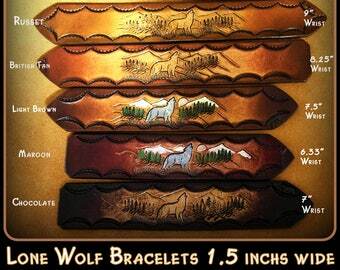 Leather handmade bracelets Lone Wolf, 1.5 inches wide, many colors, personlization can be added on either side of wolf, sizes to up to 11"
Painted animal belt, dyed chocolate, dark on the edges lighter in the center. The 8 tools needed to make the deer scene. More Orca. ...3D raised from surface, this process takes time, it makes the whales look alive, it POPS off the purse. One of life’s greatest feelings? The look on someone’s face when they see for the very first time how the raw vision in their head has become tangible and real…in the form of leather…soft yet tough, smooth yet rough. Creating these artful works of leather has been a personal evolution, one that started in 1973. My first project – utter disaster. Since that day I’ve been on my own personal leather journey for the last 40-plus years. And, each person I’ve encountered along the way is part of this journey. My fabulous wife and life partner. She makes most of the wallet insides. Does most of the shipping and cleans up after me, and I need that. Shortly after we met she said something about me being messy, I looked at her and said, "I'm an artist.... I have to be neat too?" My belt doesn't fit. What can I do about it? I consider a belt sized correctly if it's within 3/4" of the stated size from the rollover at the buckle end to the center hole on the belt. Please,Please, Please read the SIZING information listed with each belt and in the photo # 5 on most belts. If you give me the wrong size, I will remake the belt for 1/2 price...IF....you return the original belt, you pay postage each way. What do you mean "we ship by waist size"? Waist size and pants size are NOT the same. For some reason "Pant" size is 2" smaller than the actual "Waist" size. Let's say the pant size is 34" if you actually measured the waist it would measure 36" (don't know why). So, we ship for waist size. If you tell us 34" that's what our belt will be 34" from the rollover at the buckle to the center hole. If you are a 34 pants you should order a size 36 belt. Please, keep in mind our size chart when ordering is WAIST size which is 2" larger than PANTS size.